The aim of the AEAS Assessment Report is to provide Australian schools with independent and objective data on each student’s educational capacities and functioning covering English language, mathematical reasoning and general ability. The AEAS Assessment Report provides Australian schools with a screening and/or selection tool that provides information about the student that is independent from school reports and assists the school to make an appropriate offer. The Report also provides students, families (and their agents) with information to assist in deciding on a suitable English language preparation program, which school, and in selecting a course of study. The AEAS Assessment Report assists the student and their agent in identifying the school that will best meet their needs. The AEAS Assessment does not depend on students reaching a fixed pass mark. Schools will individually determine the minimum requirement for a student to be accepted. Results for each test component (English, general ability and maths reasoning) reported as a raw score and a normalised score. Normalised (standard) scores range from 1 to 9 with a mean of 5. This method of reporting results provides helpful information by placing an individual student’s result within a comparable group of Australian students. The AEAS Assessment Report provides schools with a student profile that is more comprehensive than any other available test. AEAS Assessment results are compared with the student’s recent school reports which provide an indication of academic performance. It also includes information on the student’s preferred course of study, long term goals, interests and activities and any health considerations. Reports are generally available within 10 working days of testing or sooner if an application is urgent. Upon receipt of the AEAS Assessment Report, the School should then advise the student, through the appropriate representative, as to the result of their application. 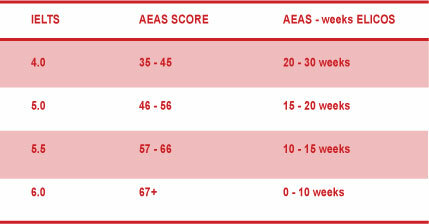 A comparison of AEAS results with IELTS scores is available for students 16 years and older applying to study in Years 10-12. IELTS testing is not suitable for students younger than 16 years. The Language Testing Research Centre, University of Melbourne benchmarked the AEAS English language proficiency tests for entry to years 10 to 12 against IELTS and prepared the following comparative table.